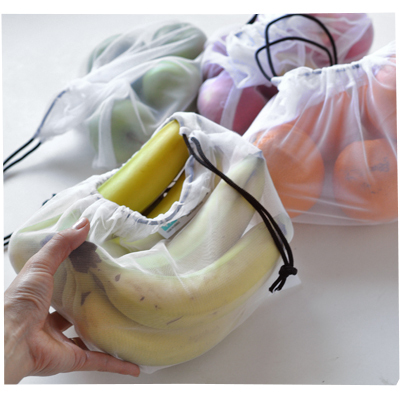 Reusable Shopping Bags for Groceries and Produce! This is a slightly different topic for me. ​This post isn’t sponsored, I’m just excited to share about something kind of cool, that’s NOT about clothes… um, but it’s still about shopping! For the last 10 years I’ve been a believer in re-usable shopping bags for my grocery shopping. I’ve tried so many types: Canvas bags, papery cloth bags, material bags, string bags. In the past, I “invested” in 6-8 bags at a time and tried to use them as diligently as I could. Most times I would forget to take them along on my grocery shopping trip. Or I just couldn’t be bothered because they were so big and cumbersome to carry around. This is what I use now. And I’m pretty good at remembering to take them along with me now. 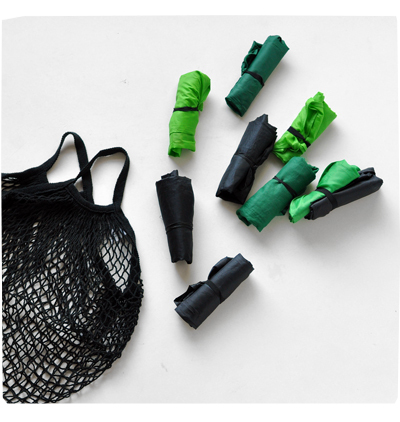 Those rolled up green and black things are reusable shopping bags from Woolworths. Even though I usually shop at Coles (it’s closer to my home) I’ve found that these bags work best for me. I’ve been using them for the last 5 years. I can’t find these reusuable shopping bags on the Woolworths website, but they sell them in-store at the checkouts. They are about $8 or $9 for a pack of 8 bags. The string bag is something I bought from the markets a few years ago and I just use it to carry all my bags. A bag of bags! 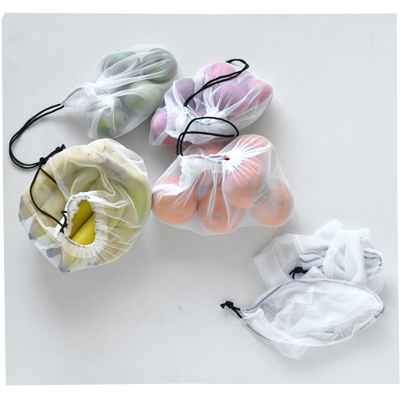 I found the string bag to be a bit impractical, because they are too big for produce, and too “delicate” for regular shopping items. Plus they were a bit expensive for each bag. Best features – They are small when rolled up. Each bag has a little elastic band that keeps it rolled up. I can easily fit about 8-10 of them in my regular handbag. Best tip – Buy a lot of them so you can use them all the time. I own about 20 at the moment, I always leave 2 at the bottom of my handbag, 10 in my car, 4 in my second handbag and there are about 4 hanging around my house and pantry. They are super strong and they can fit A LOT stuff in them (more than a regular plastic bag). They are easy to wash too. If I do a large grocery shop, spending about $250, I use about 6 reusable shopping bags. 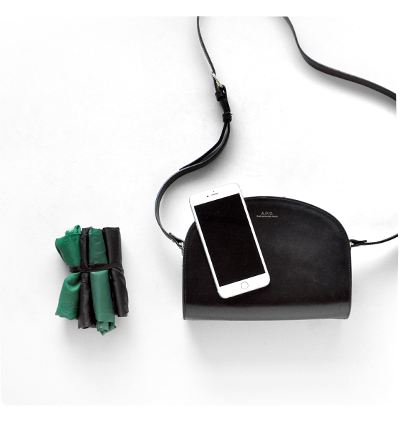 This is my petite A.P.C handbag (which is about 23 cm x 18cm) and my iPhone 6 plus (which is about 16cm x 8cm), next to 4 rolled up shopping bags. They are very compact! Ok this is what I’m more excited about, as I bought them last month. 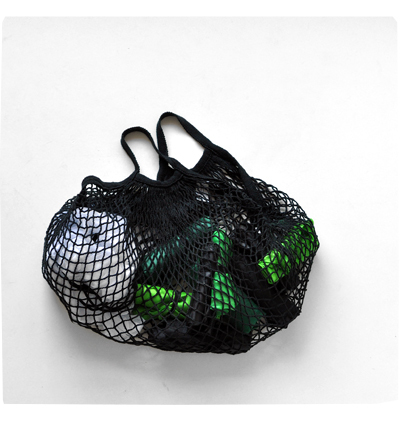 I bought the ONYA Produce Bag 8 Pack, which are made from recycled PET drinking bottles. They are 30cm x 25cm (a little bigger than an A4 piece of paper) and hold up to 2kg produce. So far, 8 bags have been enough, but I might buy another set in a larger size, mix them up and leave a set in my car, because yup, I’ve forgotten to take them with me a few times. Plus they tend to get a bit dirty/mucky, so I’ve been washing them, hence they are not available to be used. I love using them! And I feel so good using them, knowing I’m reducing the world of a couple of plastic produce bags each week! Happy shopping for bags for your shopping haha!